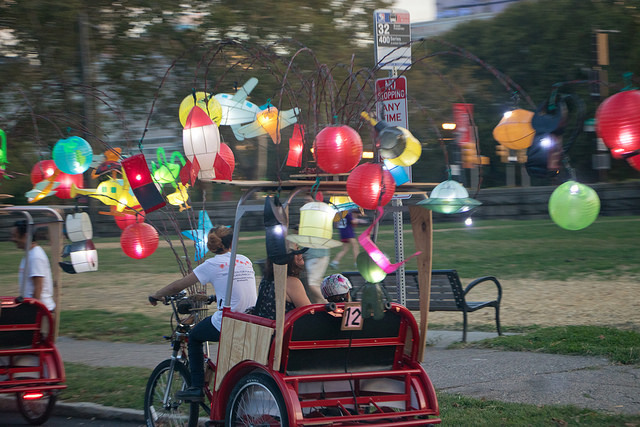 Luminous, lantern lit pedicabs pedal their way up and down Benjamin Franklin Avenue, from Sister Cities Park to Iroquois Park under the national flags that line Philadelphia’s famous Parkway. 27, in total, each cab is decorated with glowing stars, boats, ice cream cones, orbs, pandas, and planets. Each lantern is unique, and each is suspended by a thin metal pole reminiscent of a dandelion stem in the breeze, bobbing up and down with every forward pedal. 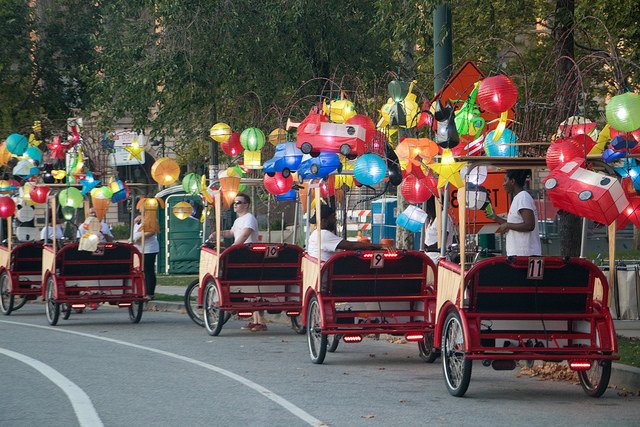 Over a thousand lanterns have been individually created in China, for Cai Guo-Qiang’s Fireflies public art installation, and the pedicabs are a whimsical, wonder-inducing sort of a sight, almost other-worldly, as if plucked from a Miyazaki film or a soft-focused childhood dream. It’s a balmy evening, unseasonable, with temperatures close to breaking all previous records for this part of the United States. It is supposed to be Autumn, but still, I am beating the heat with late night pistachio ice cream, and seeking refuge inside indoor air-conditioned manic markets, Reading Terminal Market a bustling maze of stalls selling doughnuts, herbs, tarot cards, lobster, and of course, the ubiquitous cheesesteak. 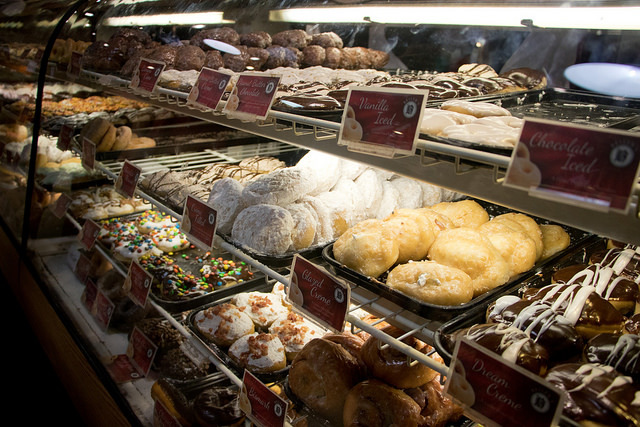 I watch bakers knead great mountains of dough, lobsters swim in giant tanks, families eating lunch together. 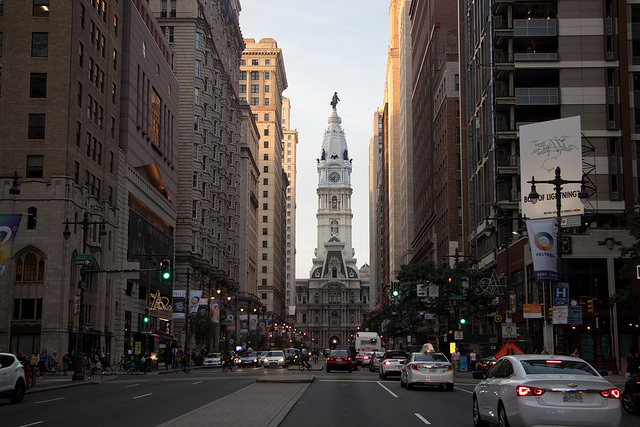 Philadelphia itself is a city of contrasts, and rich history. One-way narrow streets are lined with shuttered-window georgian terraced rowhouses, and the liberty bell sits in the center of the city, cracked and encased in glass. Independence Hall is the birthplace of the Declaration of Independence and of the Constitution. Soaring, glassy towers are also a major feature of the cities ever-morphing skyline, too, and there is industry here, oil refineries, a busy airport, the city is alive and looking to the future. I am at the very beginning of a big drive back to the West Coast, Portland and then Seattle bound. I am feeling all the uncertainties and excitement anybody might, at the beginning of any lengthy and slightly daunting undertaking. 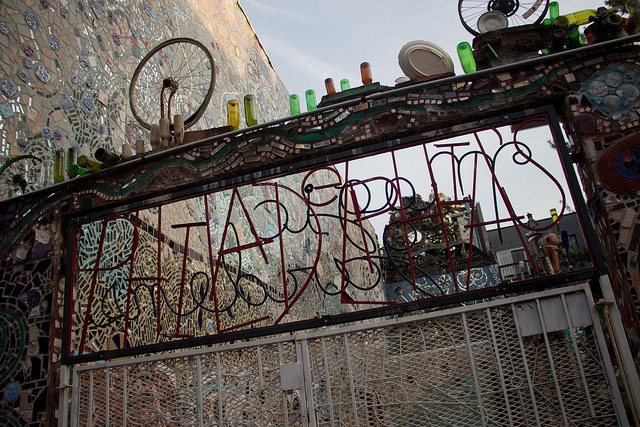 However, before heading inland and waving goodbye to the Atlantic, Philadelphia proves a wonderful and surprising place to experience, and after admiring Magic Gardens, a non-profit mosaic visionary art environment, I set my sights west.